Vendors get queries and bookings through BrideMalta. Vendors get their money's worth since our packages offer more "value for money" than of competing websites. 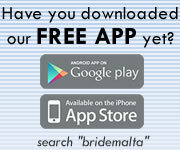 We continuously advertise BrideMalta.com in wedding fairs, local media, Google and Facebook. We offer Vendors the best service in the local wedding website industry. "Bridemalta truly have your clients' best interests at heart, working with you is a true pleasure and everything went so smoothly. The response I've had so far has been awesome! Cuz of Bridemalta's mailshots people were queuing for me at the... weddings Fair. Thanks to you guys my clients doubled !!!" - Alexia Chopping, Boo&Co. For further information you may either click on any of the below questions, or contact us directly by calling us on (+356) 79728393, email or our contact form. 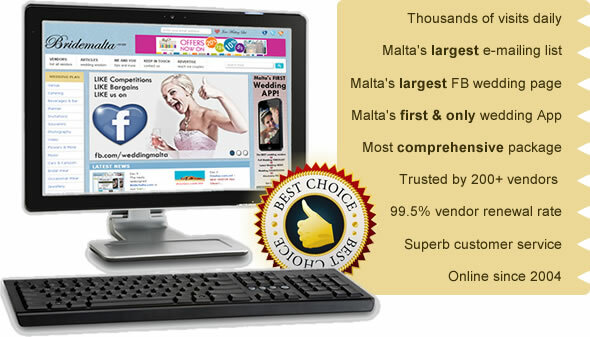 How much does it COST to advertise on BrideMalta.com? WHY should I advertise my wedding business on BrideMalta.com? How do COUPLES hear about BrideMalta.com? I am INTERESTED. What is the next step? iv) free inclusion in the FIRST WEDDING APP launched in Malta! vi) the opportunity to vendors to be displayed under 3 different sections should they offer various services. xi) Up to 100 pages catalogue in PDF format with photos of your services. Opt to renew Package A for 2 years at a reduced cost of only Eur250 + VAT! To offer our vendors even more exposure, we have also create various banner spaces within the website. For more information kindly click here to download our banner rate card. We created this Add-On following many requests from vendors to send more incredibly effective mailshots. We offer the facility for our vendors to send additional mailshots at the price of €60+ VAT (per mailshot). And better pricing can be offered on multiple bookings. Mailing List members often submit their mobile numbers for SMS notification. We therefore offer this Add-On to approximately 5000+ SMS numbers, at a cost of €100 + €0.05/SMS (+VAT). Why should I advertise my services on BrideMalta? Actually.... why aren't you already listing your services on BrideMalta? - BrideMalta.com has been trusted by over 200 wedding vendors since 2004, with 99.5% of vendors renewing their yearly membership because they are getting queries and bookings. - There are no hidden costs in our packages, and you are getting your money's worth (and more). - We advertise BrideMalta.com extensively locally and abroad. We are present in most open weekends, wedding fairs, and open days. We also advertise on TV (including Xarabank), radio (including Bay Radio), magazine and news papers. - We keep in contact with you and remind you of your benefits throughout the year. - We listen to you and help you sell your business, because we want you to renew with us year after year. - We continuously update our website, with new content and special offers, to make sure couples are up to date and therefore visit the website more often. - We have a special section dedicated to churches in Malta, wedding traditions in Malta and Gozo and various articles on religion, government, etc. - We are the most informative and helpful website. The Bridemalta Team feels it is our responsibility to help couples by answering individual emails with any queries they might have. Many couples visit us during the Weddings Fair to thank us personally for our help. - The independent facts speak for themselves: we have the largest following in the local wedding website on social media Facebook, Twitter and YouTube. Best of all, our following on these social media is increasing all the time. Word-Of-Mouth: Couples call BrideMalta.com the 'wedding bible of the Maltese Islands'. "As I have said before, had it not been for your wonderful site we probably would not have been able to arrange our wedding... [We've] been talking and would like to invite you to our wedding party at [Name of Venue] if your not doing anything. You can see for yourself how wonderful your site works... Many thanks again and I will be recommending bridemalta.com to everyone" - Kelley L.
We are proud of the fact that thousands of satisfied couples refer their friends and acquaintances to us, telling them to visit our website, join our mailing list, Like Us on Facebook and download our App. We receive and reply to hundreds of emails asking for help and advice, and love the fact that many couples take the time to send us beautiful emails after they get married. Weddings Fairs: BrideMalta.com is the only wedding website to be present in all local Wedding Fairs. We meet couples and actively promote the website by answering questions, giving our free branded merchandise, etc. We have attended the MFCC Weddings regularly since 2004, Inspirations Weddings Fair at Hotel Phoenicia, Eden Weddings Fair, Villa Maria Open Weekend, Island Caterer's / Olive Garden's / The Palace's Open Days, Maritim Hotel/ Riviera Hotel/ Le Meridien St. Julian's Open Weddings Weekend and many more. Television: From co-organizing programs, to regular campaigns on TV, we push hard. We run regular campaigns on local stations. A few examples are the Valentine edition of program 'Vlegga w Salib', campaigns on Smash TV and Net TV including 2 adverts per episode on hugely popular programs, 'It-Tieg', Sas-Sitta, Stylish Weddings and DBride. Cinemas: BrideMalta.com has partnered with Eden Cinemas in several Valentine Competitons that included on-site advertising at their St. Julians ticketing office as well as on cinema screens. Radio: We advertise regularly on the largest local stations including Bay Radio, Capital Radio and Smash Radio. Maltese Buses: In 2008 we ran a campaign on Maltese Buses. Local Newspapers & Magazines: BrideMalta.com runs regular campaigns on The Times, The Sunday Times, Wedding supplements, The Independent and The Independent On Sunday, Weddings & Homes, I Do! Magazine & Kullhadd. Most times, we also provide original editorials/articles. Foreign Newspapers & Magazines: The British Sunday Times featured a global press release in December 2006. In 2009 we collaborated on an article with internationally reknowned magazine Novias Pasarela. In 2010 we took a full page on the UK magazine Brides Abroad. We are in constant touch with the Malta Tourism Authority who we aid as required. Our own Wedding Guidebook: BrideMalta.com has partnered with a well known local wedding planner to produce Malta's Only Wedding Guidebook bride&co. Pens, CDs, VIP Cards, Leaflets& Business Cards:Couples love free items. Every year we print and hand out 1000's of branded quality Pens, leaflets, business cards, our very own Wedding CD and our immensely popular VIP Discount Card. Affiliations & Direct Contact: BrideMalta is in direct contact with Cana Movement executives, editors of most newspapers and wedding magazines, TV producers, radio presenters and wedding fair organisers. Most of our wedding vendors themselves also actively promote their BrideMalta.com pages. Online Marketing: We run a constant marketing campaign on Google and Facebook, placing amongst the first in global searches. We also advertise locally on prominent websites e.g. TimesOfMalta.com, collaborate by providing e-articles e.g. Di-Ve.com, EzineArticles, Maltavoyager and continuously forms new hyperlinks on exchange basis with other related websites. Click here for a complete list of links. I am interested. What shall I do? We would be very happy to discuss your requirements with you further and in this regard, kindly call us on (+356) 79728393, email us or send us a message through the contact form. Thank you.